At the Stowman Law Firm, P.A., we are personal injury lawyers. We help people hurt by drunk drivers or injured in drinking and driving crashes in Minnesota and North Dakota. 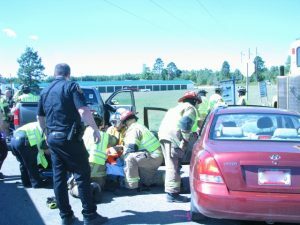 Impaired drivers cause drunk driving car crashes. Even if a driver who has been drinking is not over the legal blood-alcohol limit, the driver might be impared by alcohol. A driver who is under the influence of alcohol might be considered a drunk driver or an impaired driver. A drunk driver is driving while intoxicated (DWI). A drunk driver or an impaired driver might be referred to as driving under the influence (DUI). In most states the legal blood alcohol limit (BAC) is .08. A driver with a BAC of even .02 might demonstrate impaired driving. A driver might be impaired by marijuana or some drug other than alcohol. It is sometimes difficult to test an impaired driver, especially if the driver is impaired by something other than alcohol. Drunk drivers cross the centerline. Drunk drivers run red lights. Your observations at the scene of an accident caused by a drunk driver, and the witness statements of other passengers or witnesses to the drinking and driving accident will help. Take note if the impaired driver slurs his or her words, stumbles when walking, is disoriented, or simply does not seem normal. If other people think the driver was drunk or impaired, it is additional proof for the police or insurance company. The injury lawyers at the Stowman Law Firm, P.A., handle drunk driving accidents. We can help you if you were injured in an accident caused by a drunk driver. We help people hurt by drunk drivers in Minnesota accidents and North Dakota accidents. We can help if you or someone you know was hurt or killed in an accident caused by an impaired driver.